Click here to read all my CGS posts. This statement was another that conveyed CGS’s acceptable-but-sadly-not-exciting progress. Total revenue climbed 11% to set a new first-half record, but ongoing problems within the machining subsidiary meant group operating profit fell 3% to the lowest H1 level since 2011. CGS said customer demand at its main foundry division had remained “steady” during the six months. The word “steady” was notable — both June’s annual results and August’s AGM update had referred to “strong” demand from the group’s customers. I wonder whether the change of adjective may be signalling a slight weakening of sales. Similar to this time last year, CGS claimed higher foundry revenue was due to “the continued shift to more machined parts” and blamed the lower foundry profit on “the time lag in passing on raw material and other price increases”. 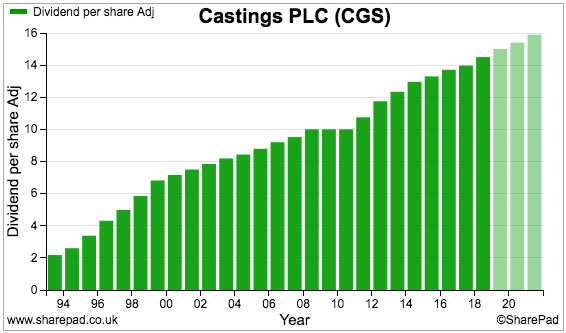 I calculate revenue and profit per tonne of castings produced now run at £2,692 and £316 respectively, which match the figures of £2,697 and £322 for the preceding twelve months. The machining division earned inter-segmental revenue of £9m from the foundry operation during the half. I have to say, the collapse of the machining division has really surprised me. When I bought my CGS shares three years ago, the division regularly produced a £4m or so profit. These days the division’s annual losses run at £1.5m. I have no reason to doubt the board and the reasons behind this depreciation review. Indeed, such accounting changes are usually hidden away in the annual report small-print — and not declared within the chairman’s statement. I should add that CGS accounts have, over time, shown cash spent on capital items (excluding property) generally matching the depreciation sum charged against earnings. The company therefore has a reassuring history of decent accounting. …extending the useful life of certain machinery — and boosting reported profit — does seem a tad cavalier. I mean, CGS has regularly invested in new machines — and I dare say that pace of change will not decrease, and so equipment becoming outdated will always be a risk. You might recall June’s annual results carried a £1m write-off relating to obsolete tools. Note, too, that the 15-year ‘useful life’ chosen is the maximum stated within the group’s accounting policies. Right now, the only clear feature of this depreciation review is its significance. The accounting change has effectively inflated this H1 operating profit by 10%. The highlight of CGS’s books remains the conservative balance sheet. This H1 statement revealed cash of £19.6m, or 45p per share, and no debt. However, cash generation was not the best during the six months. The bank balance dropped by £4.5m as more than £3m was used for additional working capital, £1m was advanced to the pension scheme and nearly £5m funded the 2018 final dividend. The working-capital movement was due mostly to “returning finished foundry stocks to satisfactory operational levels” — which I am hopeful is a one-off event. Meanwhile, the pension advance is nothing sinister. I will not bore you with the full details (you can read point 6 if you wish), but essentially CGS lends money to its pension scheme and is paid back a year or two later. This arrangement apparently helps “optimise the return on assets held by the pension scheme”. At the last count, the pension scheme showed a £22m accounting surplus. Elsewhere in the accounts, the main foundry division reported a 10% operating margin — not a great performance and the lowest H1 percentage for eight years. Needless to say, I expect the next results will once again report acceptable-but-sadly-not-exciting progress. 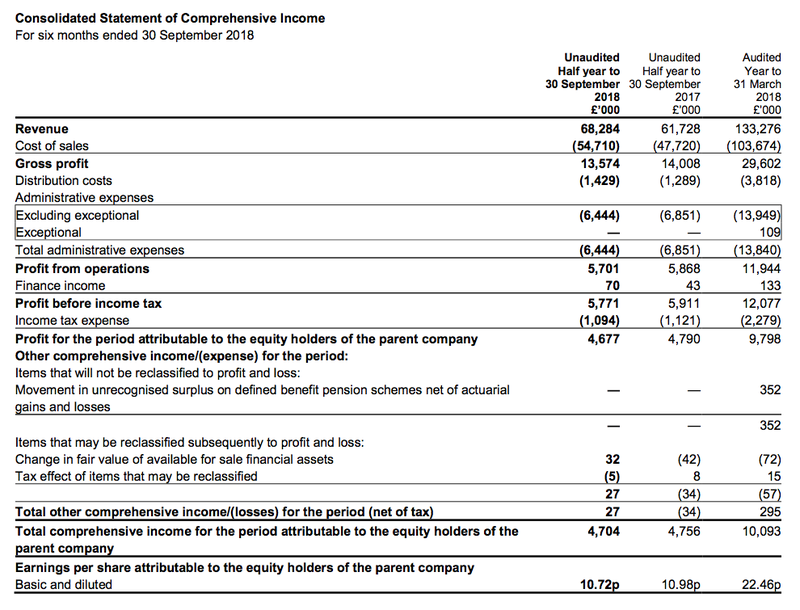 Taking the trailing twelve-month operating profit of £15.0m and deducting 19% standard UK tax, I arrive at earnings of £12.1m or 27.8p per share. Then subtracting the aforementioned 45p per share net cash position from the 400p share price, my estimate of CGS’s enterprise value (EV) comes to 355p per share or £155m. Dividing that 355p per share by my 27.8p EPS guess gives a multiple of 13. That rating does not look to be an obvious bargain given foundry profits have stalled and the prospect of a machining-division recovery has been delayed by a couple of years. Oh well. My CGS investment has largely sat in the doldrums ever since my 2015 purchase and, given these so-so results and the present valuation, I dare say the shares will remain marooned for some time to come. In fact, this RNS is further evidence of CGS not really performing as I had originally expected. True, I could look to replace this share from my portfolio. And perhaps one day I will, should a great opportunity appear elsewhere. Just based on the cash, options and dividend alone, CGS ought to come good one day. Anyway, the trailing 14.5p per share payout delivers a 3.6% income as I wait patiently for some relatively exciting progress.